Mercer University is rolling out 500 new virtual desktops based on the Unidesk® virtual desktop provisioning and application delivery platform hosted on the Cisco Unified Computing System™ with VMware vSphere™ virtualization infrastructure and VMware View™ desktop virtualization software. 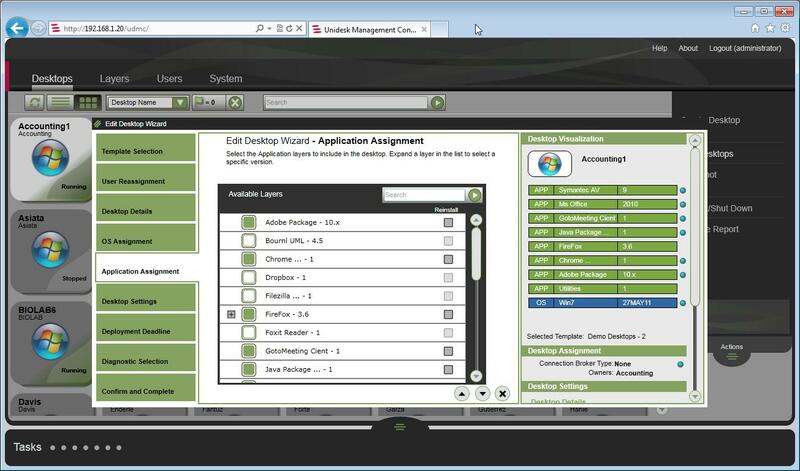 With Unidesk layers, IT can package and deliver applications and custom-build desktops in minutes instead of days. Mercer University, one of America's oldest and most respected institutions of higher learning, is rolling out 500 new virtual desktops based on the Unidesk® virtual desktop provisioning and application delivery platform as part of the university’s new “Borderless Classroom” Virtual Desktop Infrastructure (VDI) initiative. The project will offer Mercer students enhanced access to lab applications, empower faculty to more rapidly evolve class curriculums, and enable IT to reduce the operational costs of desktop management. The Unidesk-managed desktops will be hosted on the Cisco Unified Computing System™ (UCS), deployed on VMware vSphere™ virtualization infrastructure, and securely accessed through VMware View™ desktop virtualization software. The solution was delivered by Presidio®, a leading Cisco, Unidesk, and VMware solution provider partner. "Managing old lab PCs was hampering both our IT efforts and our mission to reach and support students in a borderless classroom," said Shane Milam, Director of Systems and Networks for Mercer University. "Unidesk gives us a much simpler process for deploying virtual desktops that can be accessed from anywhere, and will reduce the time needed to install new client software and make client configuration changes. With Unidesk layers, we can package and deliver applications and custom-build desktops in minutes instead of days, and satisfy the last-minute change requests we often get from our faculty and staff." On March 13, 2012, Milam discussed the business drivers behind Mercer University's VDI strategy as well as design and implementation considerations in the live webinar "Better Economics and a Borderless Classroom: Mercer University Designs VDI to Achieve Both,” now available on-demand. Unidesk’s expanding partnership with Cisco was a key consideration in Mercer University’s selection of Unidesk. Unidesk has been validated by Cisco as a complete desktop provisioning, application delivery, personalization, and storage optimization solution for Cisco Virtualization Experience Infrastructure (VXI) and Cisco UCS with both Citrix® XenDesktop® and VMware View. Cisco Validated Designs (CVDs) for Cisco VXI help remove complexity and guesswork from VDI so organizations can implement, manage, and scale virtual desktop deployments with confidence. The recently released CVDs for Cisco VXI 2.5 offer network engineers and architects design considerations and guidelines for deploying an end-to-end VXI solution that includes Unidesk desktop layering technology. Mercer University joins a growing number of educational institutions turning to Unidesk-managed VDI to expand student access to computing resources, empower faculty, and reduce energy use in the face of shrinking IT budgets and reduced staffing. Some of Unidesk’s higher education customers include Hartnell College, Massachusetts Institute of Technology, Massachusetts Maritime Academy, Menlo College, Ohio State University, Southwestern Michigan College, Tennessee Tech University, University of California Office of the President, University of Connecticut, University of Maryland, University of Wisconsin Oshkosh, and William Woods University. "The operational advantages to the IT department with Unidesk are immediately obvious, but the potential for this platform as a way to better support our users is tremendous, regardless of whether they're a full-time student accessing their course desktop from a dorm, a part-time student accessing a lab application from their employer’s office, or a faculty member on or off campus," said Mercer University's Milam. 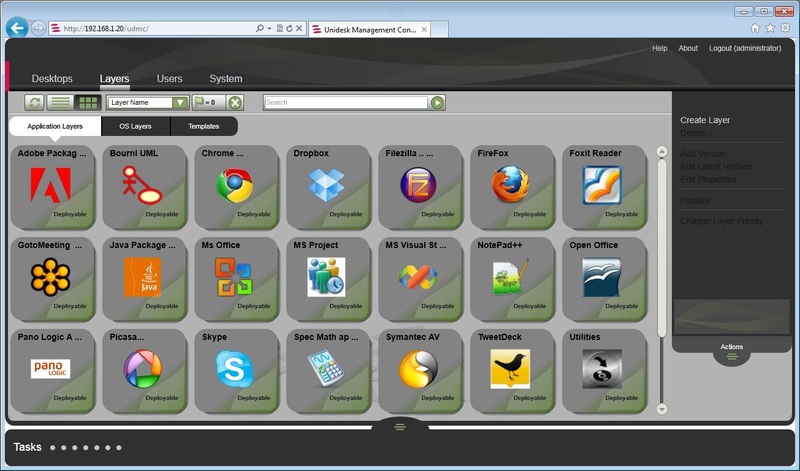 Unidesk Corporation (http://www.unidesk.com) enables customers to centralize more desktops on data center servers and cost-justify Virtual Desktop Infrastructure (VDI). Unidesk® desktop management software for VDI is the easiest way to create, patch, personalize, and support desktops and deliver applications for organizations implementing hosted virtual desktops on VMware vSphere®. By using Unidesk’s patent-pending desktop layering technology with Citrix® XenDesktop®, VMware View™ and other VDI access solutions, customers can expand VDI to more users, reduce desktop operations costs up to 30%, cut VDI storage costs up to 70%, and foster a more productive, agile workforce. Unidesk Corp. is a privately-held company with headquarters in Marlborough, Mass, USA. Unidesk is a registered trademark of Unidesk Corporation in the United States and/or other jurisdictions. All other trademarks and registered trademarks are property of their respective owners.